Efforts by the SEL Schools to replace the athletic track and perform routine maintenance on the athletic turf at Korb Field are now complete. 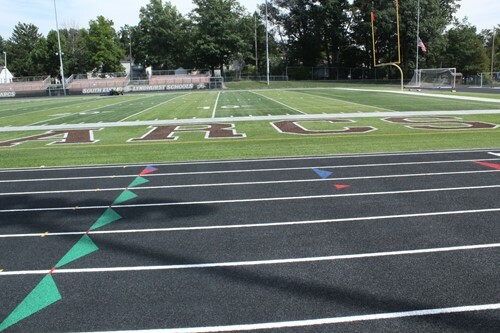 The athletic complex features a brand new, rubberized track which was deemed a top priority by the SEL Schools, as the previous track was last resurfaced in 2000 and had begun to delaminate, causing holes to develop on the track surface. In addition to the new rubberized track, the District also completed routine maintenance procedures to rejuvenate the turf field. The proactive measures are recommended to be completed every five years to ensure optimal condition and longevity for the playing surface. The entire SEL School community is encouraged to visit Korb Field and see the recent track and field surface upgrades during upcoming athletic events. To view a schedule of fall sports events, please visit http://www.sel.k12.oh.us/athletics_home.aspx. Go Arcs!